Properties in Coastal Intrepretive Center average 4.6 out of 5 stars. Property 4: PRIVATE HOT TUB, 2 bedrooms. Close to the beach, and lighthouse. Property 5: Private hot tub, 3 bedrooms, bikes, a fence and beds for your fur-babies. Property 12: Fire Pit, Fence, Hot Tub! 2 bedrooms, midweek dates message me for the rates. Property 14: Center of Town w/ Fireplace - free Wi-Fi. Property 17: Family and Pet Friendly Get-Away! Property 22: Blue Skys Await Here at Pacific Beach Condos! Steps From The Beach & Pet Friendly- NO MINIMUM STAY!!!!!! Property 27: Steps From The Beach & Pet Friendly- NO MINIMUM STAY!!!!!! Property 28: Walk to the beach! Ocean Views! Property 29: Right On the Beach! Hot Tub, Pet-friendly, Fireplace, WiFi, Best of NW Escapes! 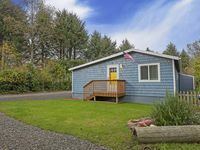 Property 47: Cozy Beach House Near Fishing, Crabbing, Clams, Casino, Winery. Property 48: Beach Dreams is right on the beach! We had a wonderful, relaxing time. The house had everything we needed and it brought us together. I was very impressed with the entire house. It was incredibly clean and stocked with anything you could possibly need. The decor was super cute and I loved all of it. The beds were so comfortable that I fell in love with the house all over again! I feel like I was able to relax at the house during the day as well as get a good nights rest each night! The linens and towels were pretty fantastic too. The backyard was amazing!! The weather wasn&rsquo;t the best while we were there but we were able to enjoy the BBQ and the fire pit for one night. We used ours&rsquo;mores kit that night too! Our kids were so happy to see all the beach toys because we didn&rsquo;t bring any with us so that was a pleasant surprise that we appreciated. My family and I had a great time at the Crowe&rsquo;s Nest and we look forward to staying there again.